I try the trick I found about back in the HRV cave with one of my Snowballs... when you leave your character standing motionless, it will only lose minimum condition from starvation. But either it only works in caves, or they have fixed it - it didn't work for Deadman 3. I sleep and pass time until the morning. Does this - together with the coal from the mine - enable fishing? It's too early to tell. I pass through the mine, heavy with coal. I find no food. Once I emerge on the other side, I jump across the fence and follow the wall up to the small cave. There is a deer carcass, but no, I can't harvest it now - if I had a bedroll and could sleep in the cave, I would, but now I can't. I'm finding more coal and firewood but I'm leaving it behind, I'm too heavy. A while later I check into the Harris Home. Nothing in there. I wait for a while for my temperature bar to fill up. Strong wind picks up as I near Commuter's Lament. Bad. I wait for a while in a car, with a burning torch in hand it is warm enough to give me a bit of temperature boost. I prepare reishi mushrooms in the meantime, then I head out on the ice, direction Misanthrope's. Wolves are blocking the way, so I return on the road and bypass the Waterfront Cottages from the right. As I set foot on Misanthrope's Island, I can see a wolf blocking the way to the cottage. I run back on the ice, trying my best to avoid it - the bear isn't home, fortunately - but it soon spots me. I'm encumbered and exhausted, but one thing I have plenty of is lantern fuel, so I use it as accelerant and make a fire. The wolf runs away and so do I.
I have no food but what I do have is a ton of coal, and I don't want to be hauling it around forever. I'm thinking again about driving a deer into a wolf. But the morning is windy, too windy for a fire. I just manage to run across the ice to Jackrabbit Island before my temperature bar runs out. In the cottage I only find a can of soda and two (!) packs of herbal tea. It looks I'll be eating herbal tea tonight. After a warming break in the bed, I walk across the ice to the Fishing Camp. It is afternoon, foggy, and the air is relatively warm. Every fishing hut has the same thing - a piece of cedar, one reclaimed wood, newsprint. At the Fishing Camp I finally find some food, the same as Deadman 1 found here - pork and beans and a granola bar, both in their twenties. I take my chances but don't get food poisoning. There's a fishing hook on the workbench, which I take, but I don't make line. 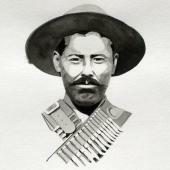 I leave the heavy hammer behind, I've concluded it is of little use to a Deadman. After another warming break I head out towards Log Sort. The highway allows me to move fast, but I also keep in mind a wolf can patrol it. The wolf barks me up at one bend, I light a torch and calmly search a trunk of a car before opening the door and letting the wolf walk away. Nothing in the car. A while later I'm on the way again, and the wolf finds me soon, unsurprisingly. This time I just walk on and at the nearest bend I make a short sprint to shake it off. Finally I arrive at Log Sort and follow the sound of the crows. By the end of the day, I harvest all meat from two deer carcasses, for a total of 3.8 kg. I also find beef jerky in the trailer. That should last me until tomorrow. I finally find some food, ... pork and beans and a granola bar, both in their twenties. I take my chances but don't get food poisoning. In the streams, we joke that this is one mode where players usually say a short prayer before eating..
"Thank you for this food.. please don't let it kill us.."
I leave the heavy hammer behind, I've concluded it is of little use to a Deadman. It mostly comes into its own when you're in a location where there are planks or crates to break down.. comes in handy as well if you're in the mood to not die when attacked by a wolf. That's accurate... even on Interloper I usually choose which food to eat. Not here. Breaking down crates or planks costs a ton of calories... it would be the last option I'd choose to get firewood. As for wolf attacks... it's a death sentence either way, so why bother. it would be the last option I'd choose to get firewood. Sometimes the last option is the only one available..
As for wolf attacks... it's a death sentence either way, so why bother. That depends if you're grimly determined to last as long as possible. I've been astonished at how long someone can survive after being knocked down to just 15% or so (days, is the answer).. and if you can find another stim before you're dead, well, you're back in the game.. "Never give up" has to become a Deadman's mantra. If anyone ever makes it to the point where they are forging equipment in Deadman, I'm pretty sure they win The Long Dark. I'm enjoying reading about DEADMAN... I am having fun with Outerloper right now but Deadman is definitely my next challenge. I don't think it's too different to Outerloper... just shorter. Good luck with your run! In the morning I just peek outside to check the weather and to eat the venison steak I left at the doorstep. It's too cold. I wait until noon before setting out. Winds are light and I reach the trailer midway to Cinder Hills Mine without any freezing. Nothing found in the trailer this time - not even that soda can. 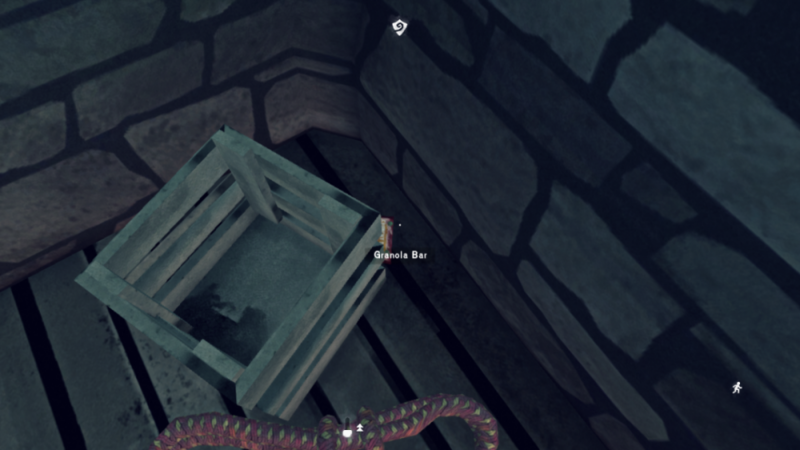 I briefly consider going to the Abandoned Lookout - for some reason I hope for a bedroll there - but it's too windy in the afternoon, and I just cut it short and go to the mine. The mine has over 30 coals and an emergency stim, but no food, I mean, NO FOOD. A box of simple tools and a bandage, both of them quite useless to me. It's foggy in Pleasant Valley. I take a look down from the path from the mine to see a wolf patrolling on the approach to Rural Crossroads. So I'm not going there and head towards End of the Road instead. The fog thickens and the visibility is minimum. I walk with a burning torch in hand, of course it's the same fire as the one that guided me through the mine, although I do not consider saving matches is not as critical on Deadman as on Interloper. I expect a wolf encounter any time, this is a wolfy place. End of the Road, search the car to find Beef Jerky. Derelict Cabins, still no wolf. A dead guy with a bottle of painkillers, my third but that's still nice. Bear cave, still no wolf and no bones in the cave. I sit down in the fog, start a fire and harvest meat from the deer carcass there: 1.2 kg, thanks at least for that. I eat it all on the spot and walk on. I reach the bridge across the Mystic River, still no wolf. I walk through the gorge and reach the Picnic Area. There is a corpse and a backpack, both empty. 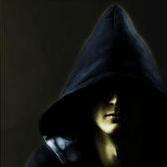 I enter the cave and search it, but what I mainly came for is not there. At least I get peaches, a storm lantern, a wool toque (in bad shape) and some coal. It's night by the time I'm done in the cave but I have to push to the bunker as without the bedroll I cannot sleep in there. I'm encumbered but after an attempt to triage what I need and what I don't I give up and just walk on. I apply the stim before bed and fall asleep in 88% condition. So in other words, a day with zero condition loss, and a stim to boot! That's good going indeed.. may there be many more such. Timberwolf Mountain welcomes me with blizzards, so I spend the day mostly in the Mountaineer's Hut, repairing a wool toque I found, boiling water, making tea and playing a game of "catch the granola bar". The lack of bedroll makes my plans complicated, but no more than the weather. Strong winds blow in the morning, so I stay by the fire in the Mountaineer's Hut and only occasionally make a dash for a few sticks or cattails. When a blizzard breaks out, I take advantage of the wolves having left and collect cattails on the far side of the lake. I take 1% hit on condition for this. I also sleep to stay rested and ready to go. This is one thing I really like about this challenge: you rest whenever you can, rather than "saving fatigue" to be able to sleep for a long stretch at night. No more senseless running before bedtime. Finally, in the afternoon the weather becomes "reasonable". I drink warm tea, grab a torch and go towards the Wing. One of the wolves on the eastern side of the lake gives me hard time, I have to start a fire to chase it off. I also hear the bear patrolling around here. A while later, as I maneuver to avoid the bear, I notice moose marks on trees. The moose is here as well - standing right beside the container I want to get into. Great. I start a fire to chase the moose off, but the first attempt fails. I'm freezing now, losing condition at a fast rate. The second firestarting attempt succeeds, but during the process the wind begins blowing in full strength: I can't keep this fire going. I run to the nearest place that offers some shelter and start a new fire, again at the second attempt. By the time I get into positive temperatures, I'm back down to 72% condition. The wind dies down within an hour and I return, with torch in hand, to the Wing. The bear can be seen in the distance, walking away. But the moose is neither seen nor heard. I'm suspicious because from my experience, they have small patrol zones - it should be nearby. As I'm nearing the container, I hear an unfriendly "moo", soon followed by the sound of something big, fast and heavy running on the snow. The moose was hidden behind a piece of debris and now it's running at me. 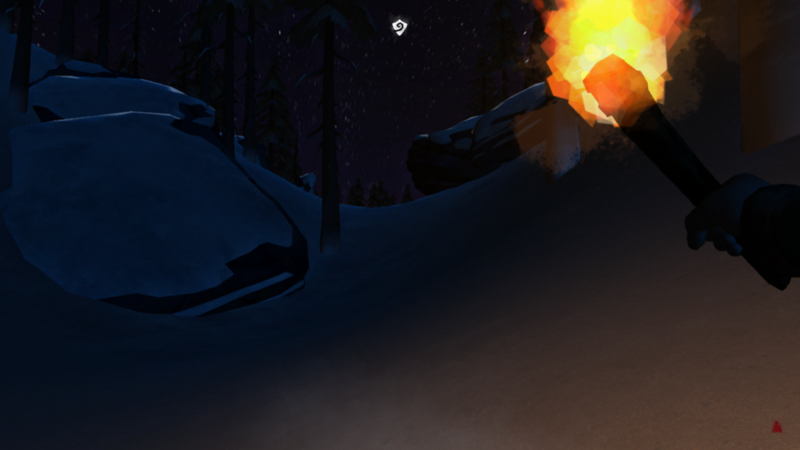 I quickly start a fire and the moose runs away. The container is finally mine. Two cans of pork and beans, one of peaches, a packet of tea and a can of coffee, courtesy of Grizzly Air. Thank you, I'll be flying with you again. An off-topic related to "proving" mentioned in the other thread on Deadman - I'm far from succeeding here or even challenging the leaders, but if anyone could help me find out how to make a video, I'm all ears. I set up a twitch account and downloaded something called Bobo, recommended for starters - but it doesn't work with computers without dedicated GPU, so no luck there either. I have Intel HD graphics. if anyone could help me find out how to make a video, I'm all ears. You could give OBS a try.. or even Fraps. Edit: nevermind.. Fraps free version is limited to 30 seconds of video. The exact same thing happened in my Outerloper run. Those moose are sneaky. Yep they are! And I should really find the time to read your story, the pieces I did read were great. Day 7 and not broken a sweat yet. Hurr. I liked the story of Deadman 2 - couldn't you have searched in the dark with a campfire projection? By the way... I appreciate how Hinterland is taking away the little tricks one by one. Somebody is watching this here and taking notes. Hinterland is taking away the little tricks one by one. Somebody is watching this here and taking notes. Heh.. playing that kind of whack-a-mole is a no-win game.. people will always find ways to use game mechanisms in unintended ways. Better to just plug the blatantly poor design flaws, and focus on improvements and new features. 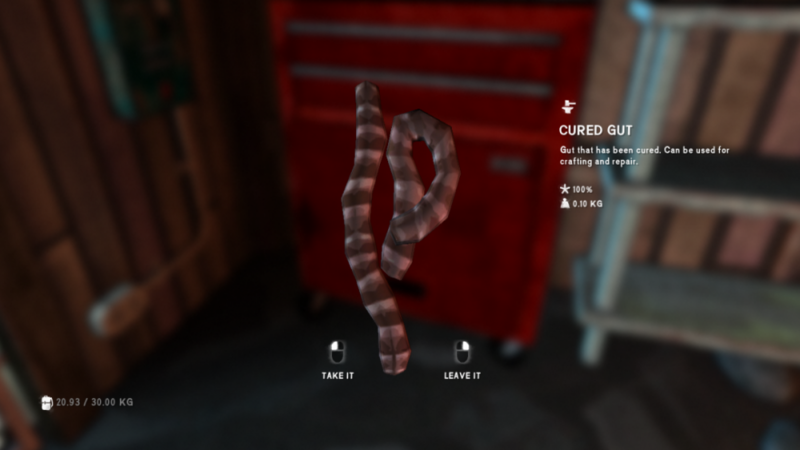 That cured gut in the toolbox in the DP-Crumbling Highway mine is an interesting item - the ability to fish that early in the game, combined with the amount of fuel you will have from the mines is great. 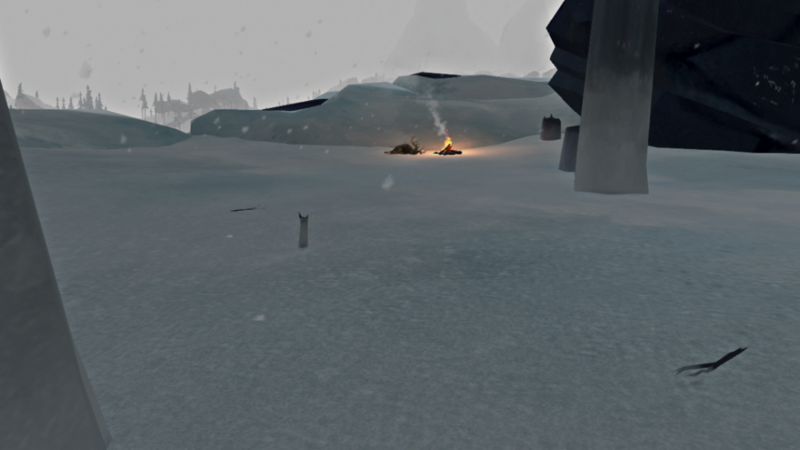 On interloper runs where I find it I usually make it into a snare for the extra bunny meat and guts. However I'm not sure what the 'calorie gain' from fishing, especially at level one is. I'm not sure what the utility of snares on Deadman is. It's interesting to note that the Deadman Challenge is effectively getting rid of the starvation exploit. I wonder whether Interloper might not be drastically improved (hem, excuse me, whether it might not be possible to create a more engaging experience for players who seek a challenge) by toning down healing to a verrry slow thing. Still possible, provided that no bar is in the red, but... well... slow. Just so that mid-term survival could be... within the range of the thinkable (not necessarily the possible, heh). I think ultimately, a body fat mechanic or a `constitution` metric - basically a second health bar that moves slower than the current one. It makes sense: When you start, you have lots of muscle mass and some body fat. 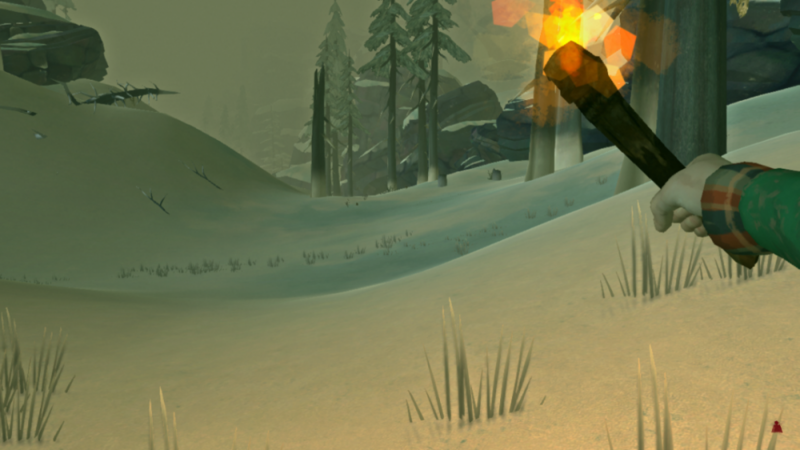 You can do the four cattails a day diet while running around carrying 30 kg of gear in the first parts of the game, but as you lose fat and then muscle the condition loss from hunger accelerates - when you are totally out of fat it should be almost as bad as being cold. 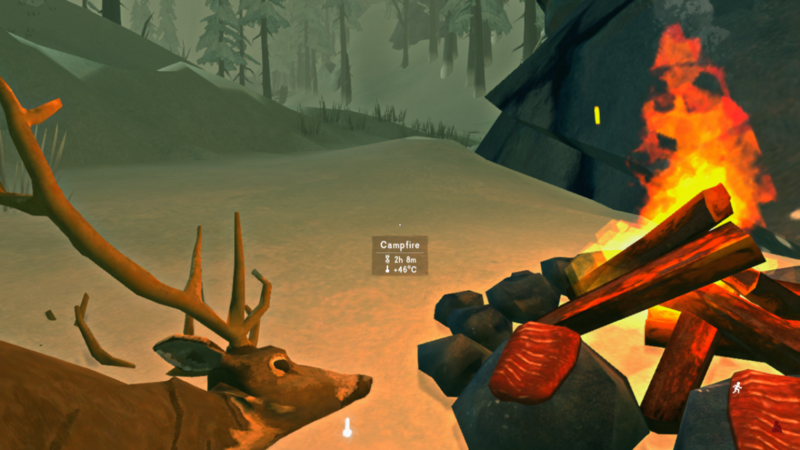 It would make end-game survival harder, because as it exists now you can eat for more than a week per deer. Once you can eat bear safely you can live even longer by bear hunting. If you needed 3500 kcal a day to stay completely fit and healthy (maybe you could use less if you are careful with how much you walk, never carrying more than necessary, etc), that would be 3 days per deer. Probably less if you butcher without tools. Doable, but you would have to keep moving and you would put 3x as much wear on your archery equipment. I'm moving too fast to use snares, but fishing is a possibility. I'm keeping the gut with me for now. The winds are too strong outside. I'm planning a quiet day today and waiting in my shelter for better weather. The opportunity presents itself around noon when the winds stop and sun appears. 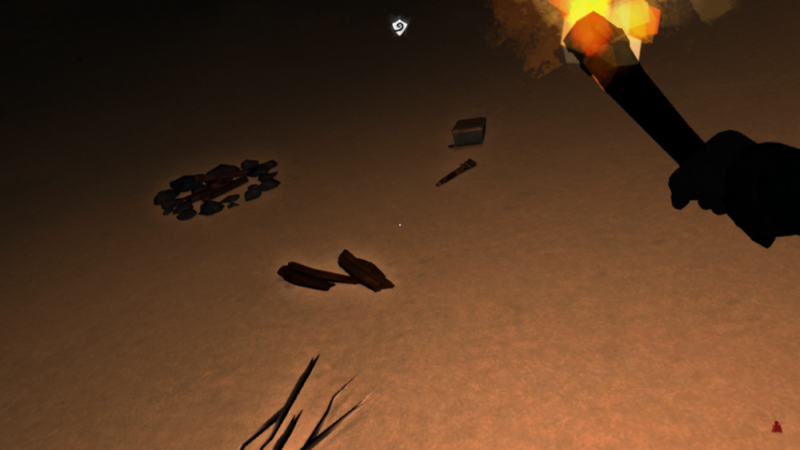 I cross to the Cave of Engines - searching a body and a backpack on the way, to find them both empty - and inside I collect a few coals, a vest, which I put on, and a book on firestarting, which will soon be used to start a fire, thereby fulfilling its purpose. Interestingly, no food again. I'm really finding very, very little food, even compared to Interloper, and wonder if it is just bad rng or the settings of the challenge. I walk out of the cave at the other engine and head to the left first. The deer carcass I came for is here, good news. Bad news, it only has 0.8 kg of meat. Not only I'm finding little food, but the ravaged deer carcasses are ravaged very thoroughly indeed. The only decent ones I found were at the Log Sort. I finish my job and since the weather is still reasonable, I go to the waterfall - one eye on the pair of wolves patrolling the river - and collect the mountaineering rope. Strong winds start blowing and I'm forced to make another fire, sheltered by a tree, to prevent condition loss. Eventually I make it to the other deployment point. My shortcut back to Mountaineer's Hut is ready. My Snowball training is paying off, I've done this a dozen times. Back to the shelter at sunset. I didn't lose any condition, it's still at 72%, but I didn't find nearly as much food as I hoped.